Remember the street guy who made headlines in March after returning Ksh200, 000 that had fallen out of a woman’s purse? 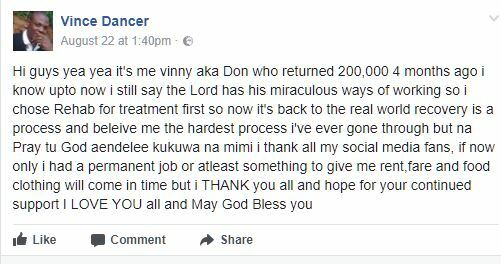 Five months later, Vincent Omondi alias Vince Dancer, is out of rehabilitation where well-wishers took him to fight his drug addiction. A transformed Mr Omondi has taken to social media with a special message to Kenyans who came to his rescue. 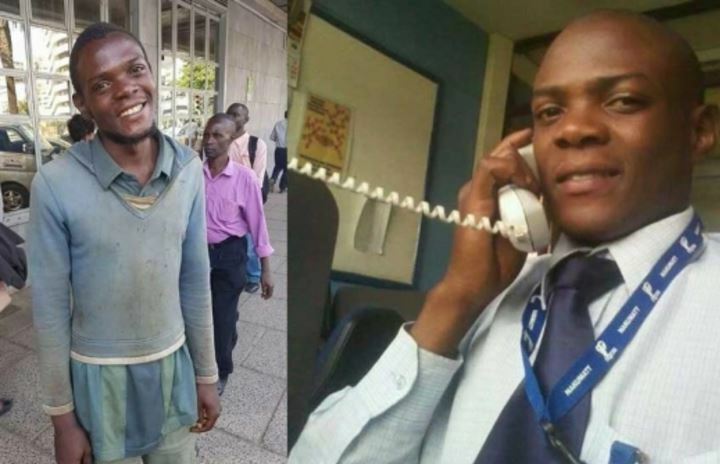 The Bachelor of Business IT graduate from St. Paul’s University has also appealed to Kenyans to help him find employment as he continues his recovery. Omondi warmed people’s hearts when the rare incident was highlighted on social media. On the said day, an employee of an unnamed business in Nairobi was heading to a bank to deposit Sh700,000 when two bundles of Sh 100k each, fell out of a bag after a zipper caved in. Moments later, Omondi aka Don, approached the lady with the money and after ignoring Don at first, thinking he was just another street boy begging for a handout, the lady listened to what he had to say and that is when he pulled out the stacks of money. Omondi ended up on the streets after his life took a drastic turn when his mother and father died, leaving him and his sisters to fend for themselves in the streets. Last week, he posted on his official Fcaebook page on his progress.